Ilona Buchem is Professor for Media and Communication at Beuth University of Applied Sciences Berlin, Faculty I Economics and Social Sciences. She holds a PhD in Business Education from Humboldt University and Certificate in Business Administration from St. Gallen University, Switzerland. Her research and teaching focus on fostering diversity, participation and inclusion through digital media. She has been involved in a number of projects aiming at enhancing Open Education, especially through fostering cooperations in higher education and with industry. Ilona Buchem has led a number of projects dedicated to Open Education, including Open Badge Network (Erasmus+, Strategic Partnership, KA2 2014-1-DE01-KA200-000675), BeuthBonus and CreditPoints (Qualification Programs for Migrant Academics, German Federal Program "Integration through Qualification") and Digital Future (Digital Strategies for Higher Education, Stifterverband - German Association of Foundations for Science). Her current research focuses on fostering diversity through educational technology and new media, and closing the digital divide. She designs and delivers technology-enhanced courses both on-campus and on-line. As member of the Gender & Technology Centre at Beuth, Buchem supports gender equality & diversity. Buchem has an extensive experience in designing, coordinating and participating in national and international virtual mobility actions in higher education including Seminar 2.0, iCollaborate, Future Social Learning Networks projects. She also brings recognised expertise in design of Personal Learning Environments, see publications at ibuchem.wordpress.com The program "Digital Future" at Beuth University, led by Prof Buchem is dedicated to designing and implementing digital strategies in HE with focus on Open Education and development of digital skills in HEs. Johannes Konert is professor for Web Engineering at Beuth University of Applied Sciences in Berlin since 2015. Prior to that he studied computer science at the Karlsruhe Institute of Technology (KIT), founded a social media company and became a scholarship as Ph.D. student of the DFG research training group "Feedback-based Quality Management in E-learning" while working as research assistant at Multimedia Communication Lab (KOM) at Technische Universität Darmstadt, Germany. In his Ph.D. thesis he focused on the development of solutions to use social media concepts for knowledge transfer between peers in serious games. 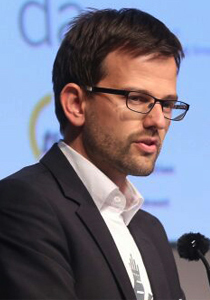 During this research, Johannes Konert coined the term social serious games and developed in several research projects prototypes of educational games which are connected to social media applications (like Facebook) in order to allow better assistance and personalization during gameplay. In parallel he was involved in the writing of the successful project proposal for the European Project ALFRED (www.alfred.eu) and was project leader for the German ministry funded project inDAgo (www.indago.de). Both projects are characterized by the use of gamification concepts and serious mini games to enrich elderly peoples everyday life, support their independence, neural abilities training and social interactivity. Currently, his research builds on these outcomes and concentrates on optimization of individual learning experiences in social media-based learning applications. His findings include a significant impact of personality traits for the effectiveness and quality of peer feedback. The expertise in optimizing the peer learning group constellations based on several criteria like participants’ expectations, personality traits, motivation and prior knowledge is expected to be a valuable asset for the project at hand. Johannes Konert developed during a three-year interdisciplinary research project a software plug-in for the learning management system Moodle to support online learning group formation.